For my birthday this year, my grandparents gave me two food-related books, one of them being The Four and Twenty Blackbirds Pie Book. 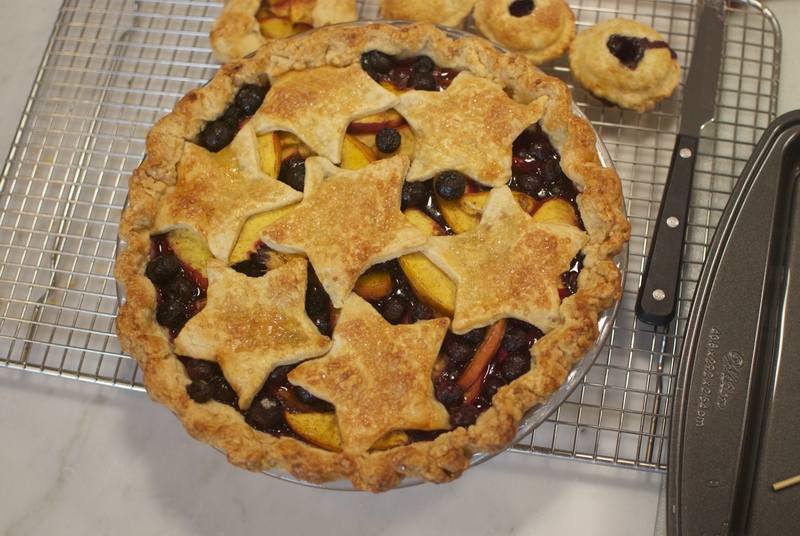 Now, I’ve mentioned Four and Twenty Blackbirds many times on this blog; I’ve shared with you the recipes for their All-Butter Pie Crust, their Salty Honey Pie, and their Black Bottom Oatmeal Pie, all of which you should definitely try. 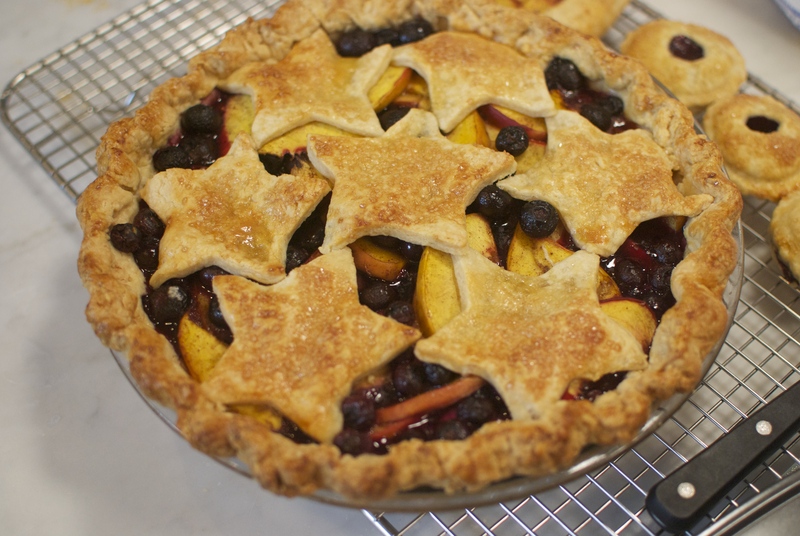 A few weeks ago as I was flipping through their book, a gorgeous nectarine blueberry pie caught my eye (and no, I didn’t mean to rhyme there), and I decided to give it a go. 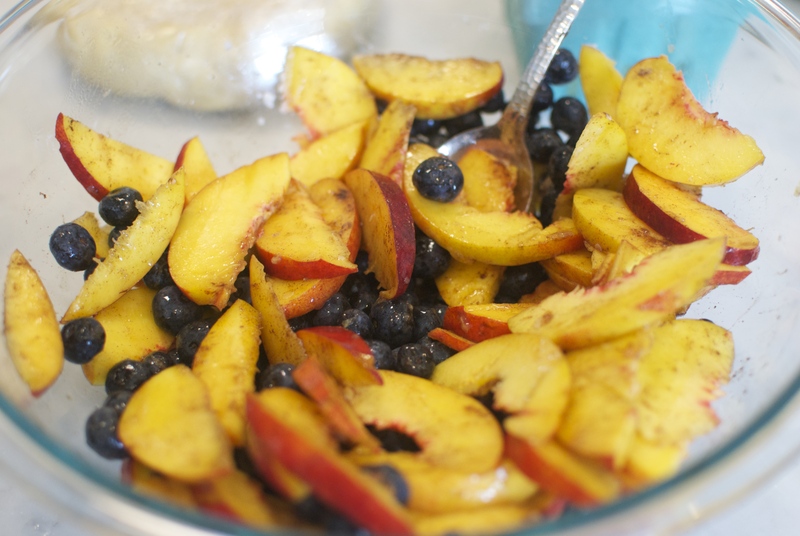 I bought fresh nectarines and blueberries from a local farm stand, and the fruit really does shine through in this summer treat. You’ll want to have a 9-inch pie pan, lined with crust (I used Four and Twenty Blackbirds’ All-Butter Crust), ready in the fridge, as well as a lattice or pastry round for the top. Another approach to the top crust would be to roll out the dough and cut out large shapes and arrange them over the pie, which is what I did. Now for the filling portion of the program, which is simple as can be. 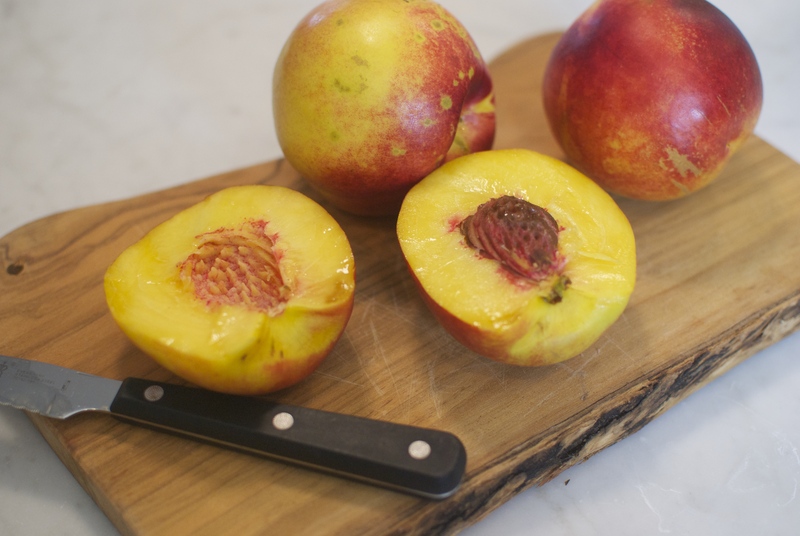 Heat the oven to 425 F, put a rimmed baking sheet on the lowest rack, and start by slicing up about 3 cups of fresh nectarines. I think I used 1 1/2. Or maybe 2. Make sure your slices don’t get too thin; you don’t want them to turn into mush in the oven. 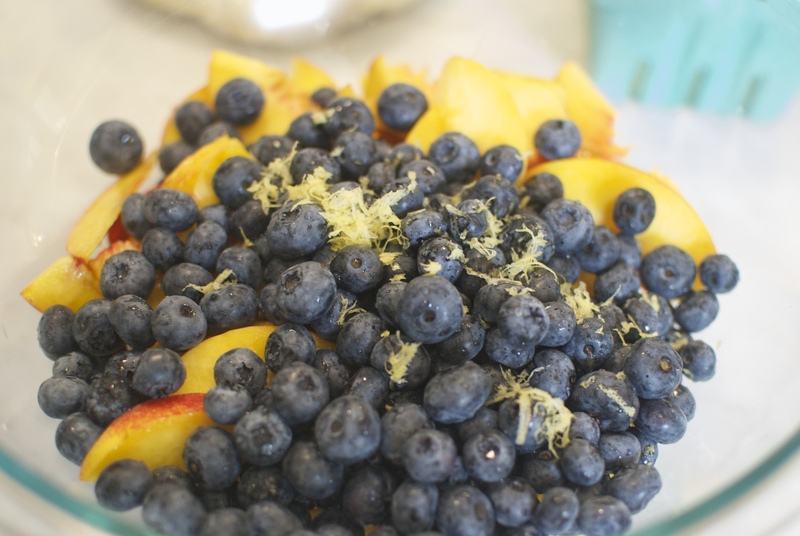 Toss these into a bowl with the blueberries and some lemon zest and juice. And add in cloves, allspice, salt, and a dash of cocktail bitters, which are optional (the book suggests Angostura). 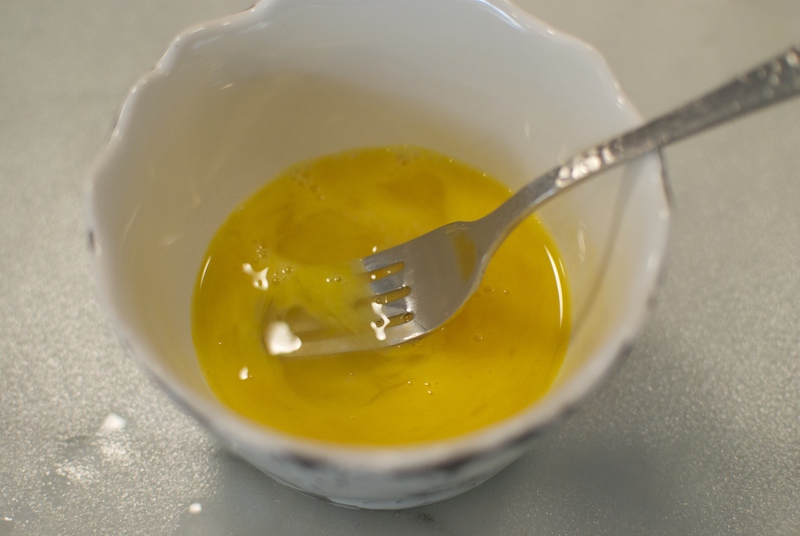 Stir these together so that everything is coated and combined. 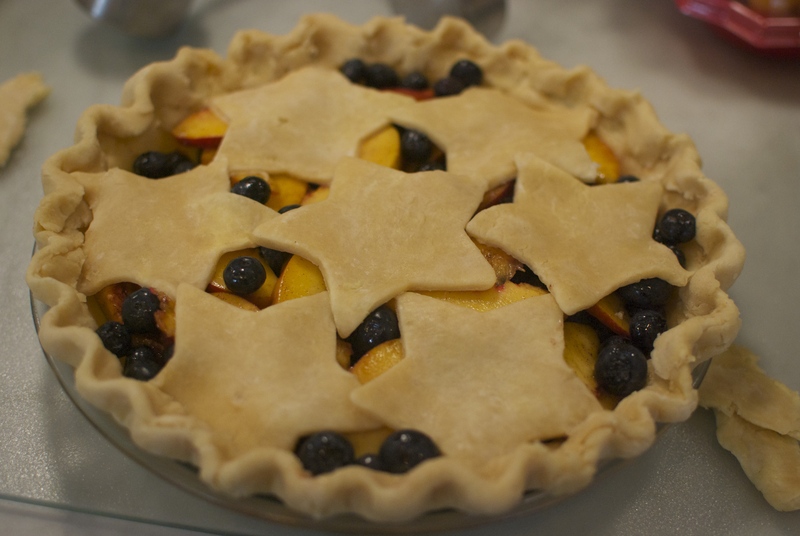 Now just load it into that pie pan, making sure that there is an even ratio of nectarines to blueberries everywhere. And crimp! I did this by placing my index finger and thumb on the outer rim and using my other thumb to push out between my two fingers (from the inside). Did that make any sense? I sure hope so. Anyway, put the pie in the fridge for 10-15 minutes so the pastry can set. And brush it right on top of the chilled pie. Finish with a little sprinkle of coarse sugar (such as Sugar in the Raw) and pop it in the oven on the lowest rack (on the baking sheet) for 20-25 minutes, until the crust has set and is beginning to brown. At this point, move the pie to the middle rack and lower the oven temperature to 375 F. Bake it for 30-35 minutes, until the crust is golden and the filling is bubbly. Mmm. Take a deep breath. Now comes the sad part: the pie needs to cool for 2-3 hours. Sigh. But trust me, it’ll be worth the wait! 1. Have ready to go and in the fridge one pie pan lined with dough, along with a pastry round, lattice, or whatever you plan to top your pie with. 2. 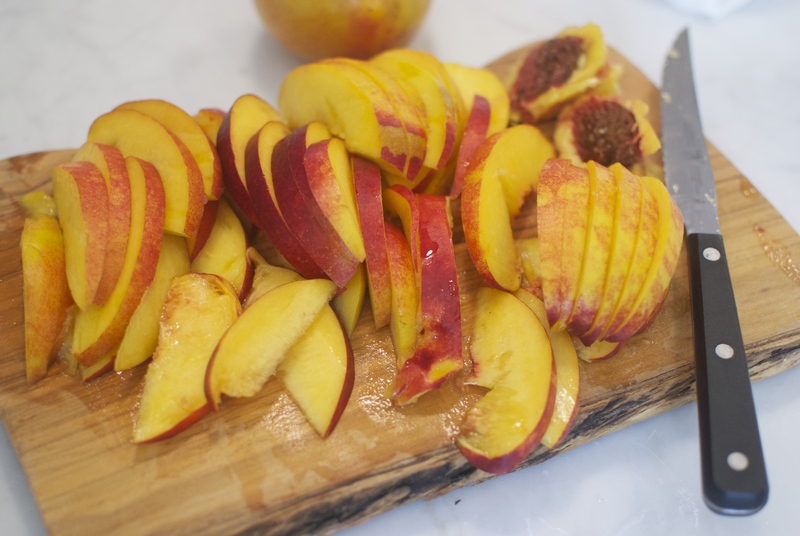 Slice the nectarines. 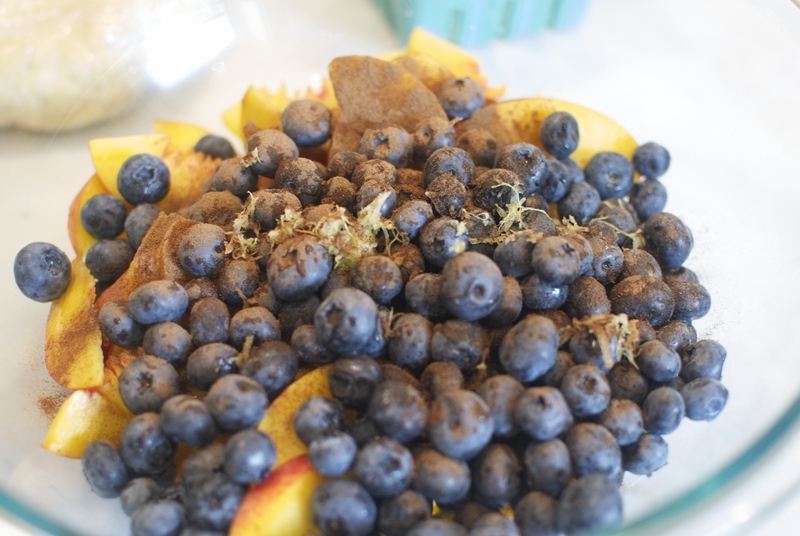 In a large bowl, combine the nectarines, blueberries, cloves, allspice, salt, and bitters and stir to combine. 3. Spoon or pour the filling into the lined pie pan and place the pastry round, lattice, etc on top. 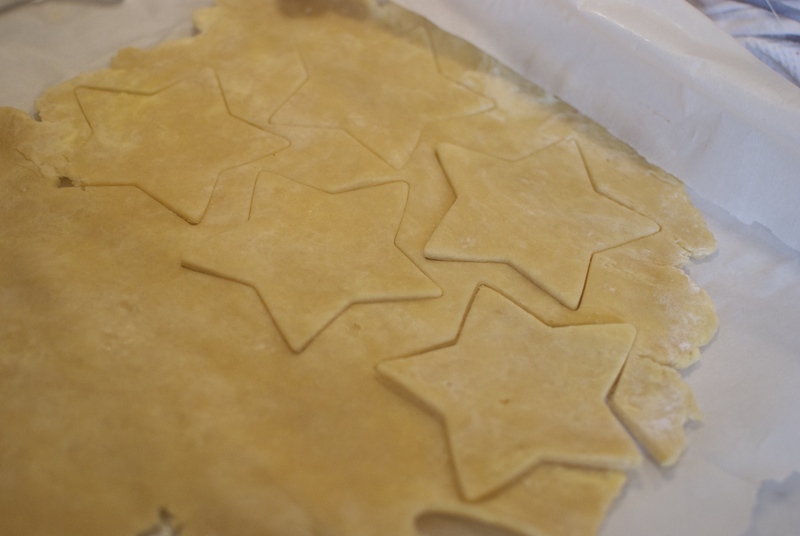 Crimp the edges and refrigerate for 10-15 minutes. While the pie is chilling, preheat an oven to 425 F and place a rimmed baking sheet on the bottom rack. 4. 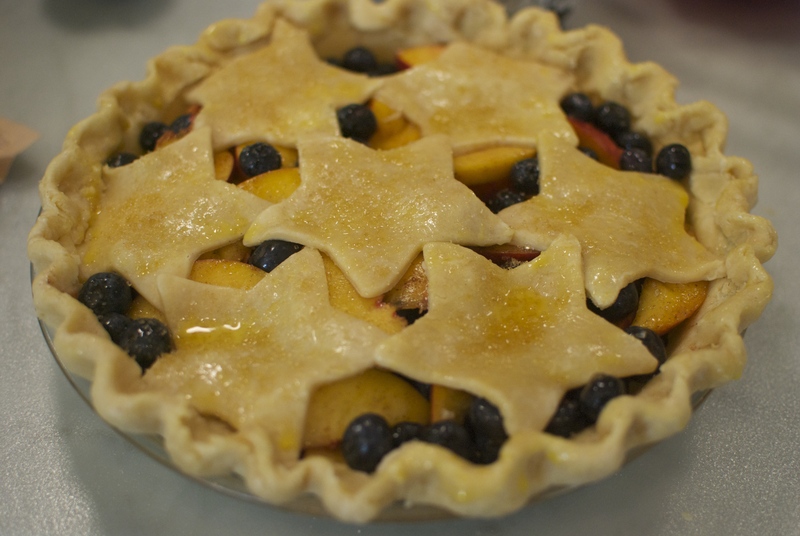 Brush the top of the pie with the egg wash and sprinkle with coarse sugar. Put the pie on the baking sheet on the bottom rack of the oven and bake for 20-25 minutes. The crust should be set and just starting to brown. 5. Lower the oven temperature to 375 F and transfer the pie to the middle rack. Bake for 30-35 minutes, until the crust is golden brown and the filling is bubbly. 6. Cool pie on a wire rack for 2-3 hours. I hope you’ll give this recipe a whirl! 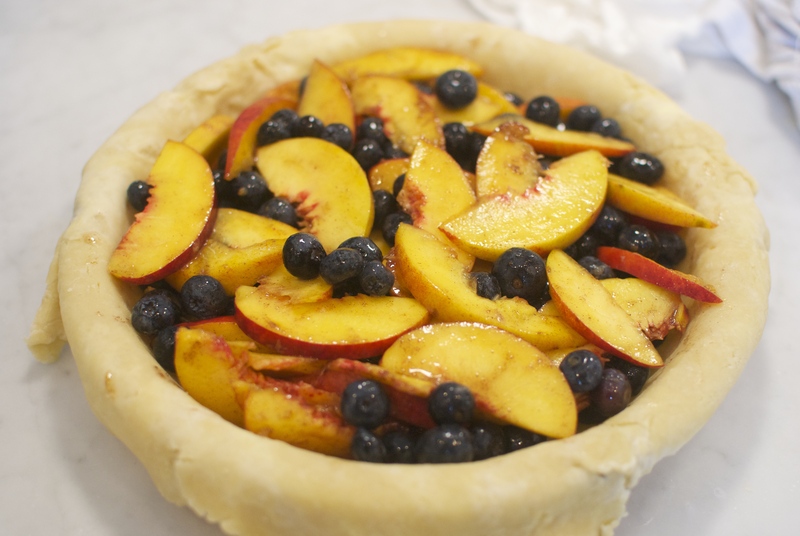 It’s a great end-of-summer pie. Happy nibbling! Hey! I know you probably made this pie ages ago, but an Amazon reviewer pointed out there was no sugar in this recipe, and that the shop said the recipe had an error due to missing sugar. Did you notice any issues when you made this, or thought it should have been sweeter? I’d like to make it this summer but just curious about the sugar. Thanks! Hi Victoria! I did make this a while ago and don’t remember exactly how sweet it was, but I do know that it was delicious enough that I wrote it up regardless. 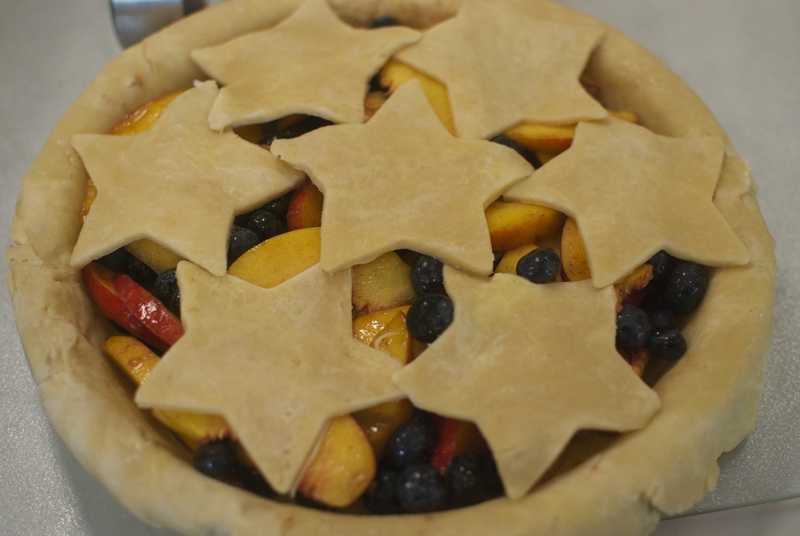 The fruit I used was fresh and very sweet, so I’d say that if you’re using super ripe fruit (and prefer things not to be too sweet, as I do), you should be fine following the recipe as written (the sugar sprinkled on the pie crust helps, as well). If you’re worried about it being too tart and want to add some sugar, you could try a tablespoon or two! I have this pie in the oven right now. Interesting that there’s no sugar or thickener in it. Was it the right sweetness with the 2 suggested fruits? I substituted peaches and raspberries and now wishing I added a little sugar. Thoughts? Hi Lisa! 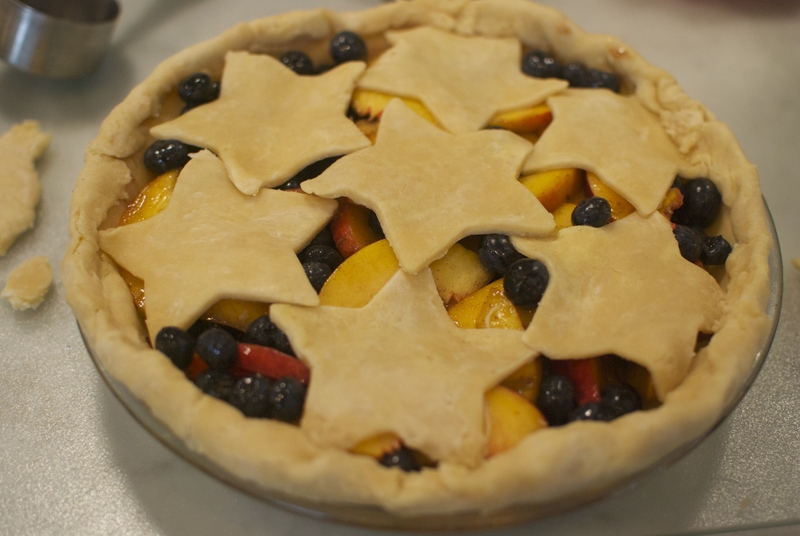 The pie worked out just fine for me when I made it as written, but I did use extremely ripe fruit in the height of summer. Raspberries can be a bit tart so maybe a little added sugar would help next time—let me know how it turns out!